News Flash: GPS signal around the Curzon strong despite blizzard conditions… Friday 26 Nov was a very cold and busy day, starting with a long chat with Maurice Thornton curator of the Curzon Collection and author of The Everlasting Picture Show, about my initial ideas. This was really helpful in getting me to think about what stories the outside of the building might have to tell, and what the user needs to know and when. Then education officer Cathy Poole and I conducted several interviews for the Curzon Memories Project, including one with George Dimond who worked as a ‘button boy’ at the Curzon when he was a lad in the 1930s. Then it started to snow quite heavily just as I was about to test the GPS signal with the Calvium Player that Jo Reid set up on the iPhone. 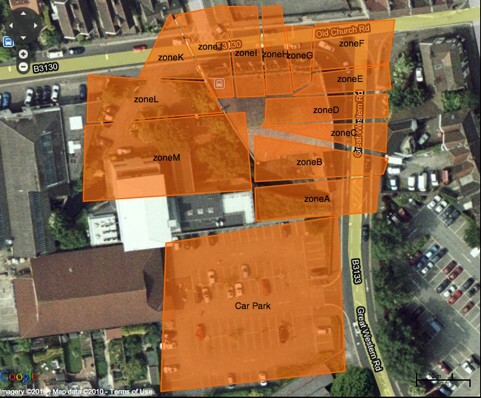 Jo has mapped various scratch audio files to Zones attached to the location (see map below), starting at the Lidl carpark and my job was to walk around and see a) if there was a strong GPS signal and b) what the behaviour of the signal was as I navigated the site. Have just had a debrief with Jo and we’ve agreed a rough outline of zones and nomenclature and I’ve now got to go away and map this out more fully so we can do another test with scratch content specific to the project fairly soon. So, overall, very excited to find that there is a signal, although, as Jo suggests, it will be worth developing the App so it works even if the GPS is not enabled (so can also be used on iPads and iPods for example). Walking around the building after having spoken in depth with Maurice, and debriefing with Jo today, has started to cement some of the loose ideas knocking around in my head. Can’t wait to get started. This entry was posted in Cinema buildings, Curzon, Exterior localization, GPS, Interviews. Bookmark the permalink.